Very family and dog friendly traditional pub with a real fire located in the historic coastal village of Limekilns. Regular live music and open mic nights. Serving a wide range of refreshing beers, ciders, ales, wines and gins with something to suit everyone's taste. You can enjoy delicious and freshly prepared food from pub classics, light lunches and tasty meals for the kids. We host regular entertainment and show all the latest sporting action that Sky and BT Sports has to offer. Function room with river views available for hire and a large enclosed beer garden open during the summer. It's Easter Sunday!!! And we are hosting & roasting!! Book your table for a family affair, we'll have a bouncy castle out back for the kids too, just so they can have some fun when searching for eggs!! Call 01383 872259 to reserve your table or message us here. Serving amazing home cooked breakfasts every weekend from 9.30am to 11.30am. 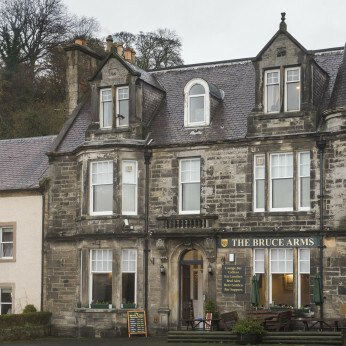 We are delighted to advise that you can now Click and Collect from The Bruce Arms for immediate collection. The award-winning Isle of Harris Gin is the distillery's inaugural spirit release.